Everyone knows fetch, and the chances are your Husky puppy will pick it up very quickly. Find a small, durable, rubber toy that can fit in your puppy’s mouth, but not so small that he or she might be tempted to eat it. Balls are great because they bounce along the ground and help train your puppy to predict moving objects. Just as important as retrieving the toy is dropping it on command. Use a simple command such as ‘drop’ and be sure to use feedback and treats to encourage this behavior. The drop command might come in handy later if your puppy likes to steal other things around the house, such as your shoes and socks! If your puppy likes to get excited and boisterous (and Huskies are likely to) then try this game of bringing things to a halt. When the excitement is high and your puppy is bouncing around, call ‘freeze!’ and stop. Totally freeze up: in movement and facial expression. Sure your puppy won’t understand this at first, but when your puppy does quieten down, give some positive feedback and a treat to acknowledge he or she is doing the right thing. Like ‘drop’, the ‘freeze’ command will be handy later on when your puppy gets out and about. Bring able to bring an over-excited Husky to calmness in public areas, or when guests are present, is an essential skill. If your puppy has a few toys there is a good chance it prefers to play with one in particular. So give this toy a nickname to identify it – the name doesn’t matter so just pick a characteristic that is easy to remember. For example if the toy is a rubber chicken, you might call it ‘chookie’. Now, use this name whenever your puppy picks up that toy. Over time your puppy will learn the association with your nickname and that toy, which you can use during fetch. Furthermore you can hide this toy around the house or yard and ask your puppy to ‘find chookie’. Once this toy is learnt move on to other toys or objects. 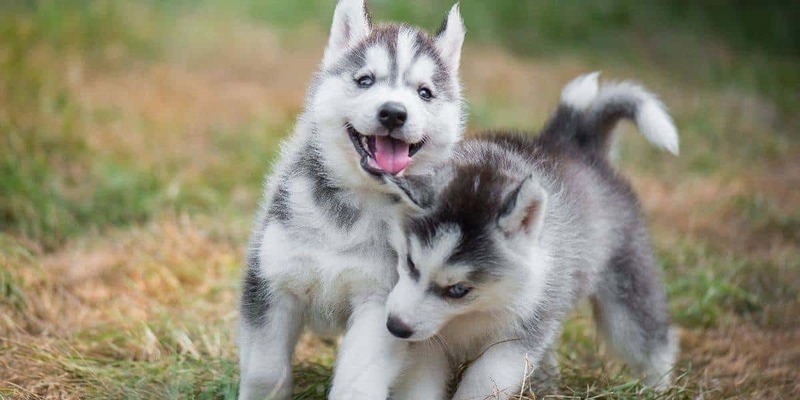 Dogs have a remarkable ability to learn words and Siberian Huskies are no exception. A chew toy such ask a Kong or Nylabone is going to keep your puppy engaged for long periods of time, and the toy itself should last months or years of heavy chewing abuse. Typically you stuff dry dog food in with peanut butter and leave it to your Husky to get the treat out! This is a great toy to leave a dog that is left alone in the yard. A Husky’s temperament is inquisitive and, if left to become bored, may become destructive. So a toy such as this is a good distraction if you are out or unable to keep an eye on the dog. Find a ball that is too large to fit in your Husky’s mouth, and reasonably soft or bouncy, and simply play soccer with him or her. At first your puppy might try to grab the toy in its jaws – but after he figures this can’t be done he will start pushing it around. A good alternative to fetch if you don’t want puppy slobber all over your hands! Whatever game you play just be aware that a puppy can tire out quickly, so limit physical exercise to 10 minutes at a time before a rest. As your Siberian Husky puppy grows, you can extend this playtime, plus of course mix it up with walking or jogging your dog for exercise.